Humbrol Limited is a British manufacturer of model kits, toys and paints, producing under its own brand and the Airfix, Sky Marks, Young Scientist, 1st Gear, High Speed and W. Britain brands. In 2006, the company entered administration, but later the same year was acquired by Hornby plc, who has since re-launched the brand. The former factory in Marfleet in 2008. Humbrol was founded in Kingston upon Hull as the Humber Oil Company in 1919. During the 1950s and 60s, Gerald Barton turned Humber Oil Company into Humbrol which developed a range of model paints and other modelmaking paraphernalia. In 1976, Humbrol became part of the Hobby Products Group of the international Borden, Inc. group. Five years later, Borden also acquired the French kit manufacturer Heller. The Airfix model company joined the group in 1986, transferring its kit production to the Heller factory in Trun, Orne, France. In 1994, the group was acquired by an Irish investment company, Allen & McGuire, and the business was restructured under the Humbrol name. Heller was sold off in 2005 but continued to manufacture kits for Humbrol. 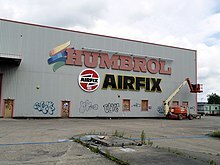 On 31 August 2006, following the collapse of Heller SA, Humbrol went into administration. It was announced on 10 November 2006 that Hornby Railways would acquire certain assets of Humbrol, comprising Airfix, Humbrol paints and model accessories and the Young Scientist brand for £2.6 million. Humbrol is possibly best known for the enamel paints manufactured for use with plastic model kits. The archetypal container was a 14 ml tin with the lid coloured to illustrate the paint colour and an embossed reference number. Humbrol did, however, sell 50 and 120ml tins and spray cans in some colours. The 50ml enamel paint tins and spray paints are still available. The tins are called "Humbrol DIY". Humbrol's main factory was located on Hedon Road, Marfleet in Hull. In 1988 an acetone spill at the factory caused a fire resulting in the death of an employee. It closed c.2006 and the site was completely redeveloped by 2014. The British artist George Shaw uses Humbrol enamel paints to create highly realistic paintings on MDF board. Most famously, he uses as his subject a council estate in Tile Hill, Coventry. The British artist Penny Taylor-Beardow also uses Humbrol enamel paints on board in her Waterways themed paintings. ^ "Home". Hornby. Archived from the original on 12 July 2011. Retrieved 5 November 2009. ^ "Humbrol development complete eight years after factory closed". BBC News Humberside. 20 August 2014.